Be the first to share your favorite memory, photo or story of R L. This memorial page is dedicated for family, friends and future generations to celebrate the life of their loved one. 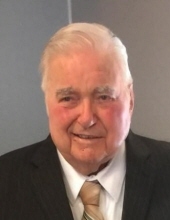 RL Cochran passed away peacefully at home in Oak Park, MI on Saturday November 24, 2018, at the age of 90. He was born to Clifton "Otho" Cochran and Pearl (Lindley) Cochran on October 27, 1928 in Marked Tree, Arkansas. RL began his 20 year military career with the U.S. Army at the age of 17. He was a Korean war veteran and a member/captain, of the U.S. Rifle Team, where he received many awards and high honors for exemplary service. After retiring with the rank SFC from the Army in 1965, RL and family moved from Fort Benning, GA to Oak Park, MI, where he worked as a truck driver until he opened Cochran's Shell in Berkley, MI, a family business he proudly operated with his wife Florence from 1975 until 1985. RL is survived by his children, Gregory (Jackie) Cochran of Marked Tree, AR, Douglas (Charlotte) Cochran of Madison Heights, MI, and Tina (Scott) Rossman of Oak Park, MI, his grandchildren, Cari (Cochran) Shinabery, Mellisa Bombery, Joseph Bombery, Douglas Bombery, Amanda (Cochran) Patton, Danielle (Cochran) Bursey, Rebecca (Rossman) Sanders, Michael Rossman, and Daniel Rossman, many great grandchildren, his siblings, Joann Burgess of Trumann, AR, Clifton Cochran of Southgate, MI, and Patricia James, of Blytheville, AR, and many nieces and nephews. RL was preceded in death by his wife of 56 years, Florence (Wallace) Cochran, son Daniel Cochran, daughter Teri (Cochran) Bombery, step-son Donald "Picalo" Coomer, and siblings Hildred Cochran, Wayne Cochran, Fremont Cochran, OD Cochran, and Lucille (Cochran) Adamson Boyd. Known as "Uncle RL" to many, "Pappaw" to most, RL was easy to love and will be missed always by all who knew him. Committal service with Army Military Honors will be held at Roseland Park Cemetery in Berkley, Michigan (NW corner of Woodward Avenue and Twelve Mile Road), Wednesday, November 28, 2018 at 2:00 P.M.
To send flowers or a remembrance gift to the family of R L Cochran, please visit our Tribute Store. "Email Address" would like to share the life celebration of R L Cochran. Click on the "link" to go to share a favorite memory or leave a condolence message for the family.